The National Rifle Association released the following statement this afternoon concerning the nomination by President Obama of Judge Merrick Garland to fill the late Justice Antonin Scalia's seat on the US Supreme Court. ü Merrick Garland’s record on the Second Amendment is unacceptable to anyone who respects the U.S. Constitution and an individual’s fundamental right to self-protection. ü He is the most anti-gun nominee in recent history. This should come as no surprise, given President Obama’s disdain for the Second Amendment. ü He has consistently shown a complete disregard of the rights of law-abiding gun owners. ü Garland’s history of anti-Second Amendment rulings support the conclusion that were he to be confirmed he would vote to overturn Heller. o In 2007, he voted to give D.C. a second chance to have its handgun ban upheld after a three-judge panel struck it down. At the time, this was the most significant Second Amendment case in America. o In 2004, Garland voted against rehearing another Second Amendment case (Seegars v. Gonzales), effectively casting a vote against the individual right to keep and bear arms. o Justice Scalia was the author of Heller v McDonald. Heller affirmed that the Second Amendment is an individual right. The Heller decision stands in the way of gun-control supporters’ ultimate goal of banning and confiscating guns. o If Heller is overturned, the Second Amendment for all intents and purposes would cease to exist. o In 2000, Garland voted in favor of the federal government’s plan to retain Americans’ personal information from gun purchase background checks despite federal laws prohibiting national firearm registration and requiring the destruction of these records. o Judge Garland weighed in on several significant firearms-related cases, including Parker, Seegars, NRA v. Reno,. He voted against the rights of firearm owners on each occasion. ü It’s almost certain that Garland agrees with Hillary Clinton when she said “the Supreme Court is wrong” that the Second Amendment protects an individual right. ü In his nomination, President Obama has again placed partisanship and antagonism towards gun owners above the higher callings of his office. 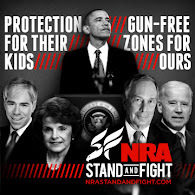 ü If Garland is confirmed, Obama would be taking America back in time to an era where Supreme Court justices uphold the anti-gun policies of the president. Obama is hoping Garland will overturn the Supreme Court precedent that stands in the way of confiscatory gun control, like the gun ban and confiscation programs implemented in Australia. It’s almost certain that Garland agrees with Hillary Clinton when she said “the Supreme Court is wrong” that the Second Amendment protects an individual right. With all due respect to whoever writes the NRA's press releases, this statement is entirely unnecessary. It relies completely on speculation ("almost certain") and outrage/emotion (name-dropping Hillary), and contributes little (if anything) of substance to the piece as a whole. Personally, I'd even go a step farther and say that the opportunity to name-drop Hillary and her asinine quote is its sole purpose. But that's just my opinion. I feel as if guns should be used as a safety device. Having guns is not bad but using it carelessly and with bad intentions is never good. This will make things safer and secure but the only thing making it worse is the attitude of people towards guns. Guns should be used to safeguard the people around you, not to bribe or threaten them.